The only challenging thing about making a BLT is figuring out how not to make a mess while cooking the bacon. I can’t claim to have invented a way to do this, but I have a way to do this. I lined a small, rimmed baking sheet with foil and placed a rack inside it. (I used one of Kim’s rectangular cookie cooling racks.) I then laid five strips of bacon across the rack, which was all that would fit, and put the bacon in a 350 degree oven. I checked the bacon after 15 minutes and decided it need more time and then took it out of the oven 10 minute after that. The 25 minutes was enough to cook the bacon until it had just started to crisp around the edges. I didn’t turn the bacon while it was in the oven, so I had to be careful, because a little bacon grease had pooled on the top of each strip and a lot had collected in the bottom of the baking sheet. I used a pair of tongs to carefully tip each piece of bacon sideways over the baking sheet to drain the grease and then transferred the bacon to a paper-towel-lined plate. When the bacon had cooled, I blotted it with the paper towels, transferred it to the cutting board, and cut it in half to make it easier to work with. Normally, I would have saved the bacon grease, but this time I didn’t, as I had no real plans for it. I am certain I will regret this decision soon and quite possibly for the rest of my life. While the bacon was cooking, I was able to prepare everything else. I cut four, medium-thick slices from a heirloom tomato and seasoned them generously with salt and pepper. Tomatoes can be a little dull on their own, so you definitely want to use at least a little salt to liven them up. Using another “life hack” I picked up along the way, I cut all four slices of tomato in half to make it easier to arrange round slices of tomato on square slices of bread. (You can see how I did this in the photo below). 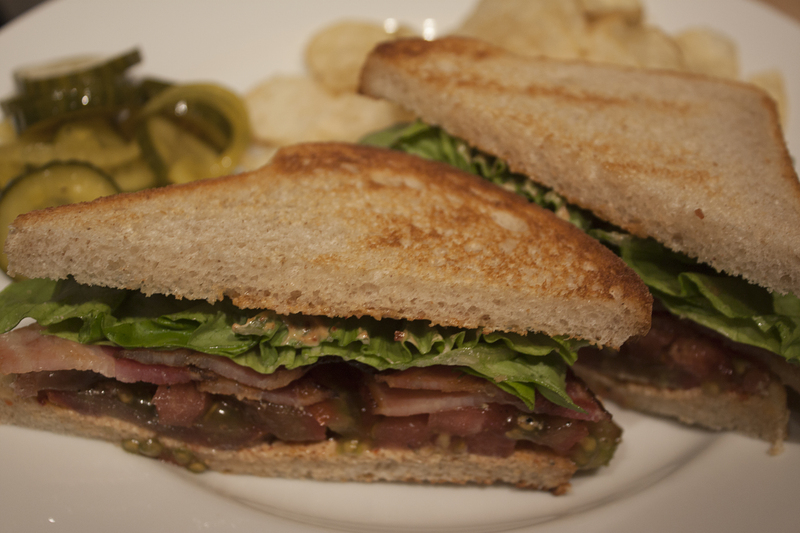 …then piled up the tomato, bacon, and lettuce. I cut each sandwich in half and plated them with some potato chips and the last of the fantastic Recipe Girl bread and butter pickles we made a couple of weeks ago during our bread and butter pickle taste-off. We popped open a couple of Sierra Nevada Torpedo IPAs, put on the Yankee game, and had a very casual but delicious dinner.